A sharper Edge, but not worthy of the ST badge. The 2019 Ford Edge ST marks the first crossover from the Blue Oval to bear the mark of its performance-oriented ST sub-brand. Not nearly as engaging as the current Fiesta ST or outgoing Focus ST, the Edge ST is at least more fun to drive than the run-of-the-mill Ford Edge. Thank the ST’s reworked suspension, which strikes a nice balance between comfort and performance, and a model-specific twin-turbocharged V6 engine. While we remain somewhat saddened by Ford’s decision to dilute the ST brand by applying it to the Edge, the model is entertaining enough to warrant consideration over lower-level, four-cylinder Edge trims. That said, the Edge ST is noticeably more expensive and less fuel efficient than its lesser stablemates. Although the ST is the most enjoyable Edge to pilot, we’re not sure its dynamic improvements are enough to overcome its financial foibles. The Edge ST is the priciest trim in the Edge lineup, and its $42,355 base price tops that of the entry-level Edge SE by $12,360. That coin, though, nets a dedicated performance model that includes standard all-wheel drive (a $1,450 option on the SE), a trim-specific 335-horsepower twin-turbocharged V6 engine, special suspension tuning, and distinctive exterior styling. In fact, there’s truly no direct competitor to the Edge ST. Only the 2019 Chevrolet Blazer RS comes close, although the bow-tie-badged crossover does without a model-exclusive engine. Despite this, the Blazer RS actually costs $1,145 more than the Edge ST. Still, the Ford’s value is relative. If performance is a high priority on your mid-size crossover shopping list, then it’s hard to argue against the ST. But if – like many buyers in this segment – you seek the latest comfort, convenience, and active safety kit, then you’ll need to shell out a sizable chunk of change on optional extras. Thanks to $9,370 in options and $1,095 in destination fees, this Edge ST wears a sticker price of $52,820. That’s uncomfortably close to high-end performance-minded crossovers such as the $54,650 BMW X3 M40i and the $56,250 Mercedes-AMG GLC 43. Of course, this heavily optioned Edge comes with features missing from the base X3 M40i and GLC 43, but what the Ford offers in toys it lacks in driving engagement and prestige. The ST is the looker of the Edge lineup. Adorned with model-specific exterior kit that includes an aggressive front fascia drawing inspiration from the Mustang Shelby GT350, an egg-crate-style grille, special side cladding, and a shapely rear bumper cover with squared-off cutouts for the dual exhaust system, the Edge ST looks the business. This tester took things a couple of steps further courtesy of $595 worth of White Platinum paint and the addition of the $2,695 ST Performance Brake package that adds a set of black-painted 21-inch wheels (replacing standard 20s) and red-painted calipers (as well as a host of performance items). The interior relays a similar vibe, and the Edge’s generally attractive cabin benefits from distinct ST items such as a steering wheel with special badging, kick plates, and front seats. These features complement typical Edge details that include an array of quality plastics, a new-for-2019 twist-dial shift lever, and massive A-pillars that can hide whole compact cars from the driver’s line of vision. The view out the rear isn’t much better, as the Edge’s thick D-pillars also leave large blind spots. Although the ST’s suspension tuning is stiffer than that of other Edge models, the Blue Oval’s most sporting mid-size crossover remains a comfortable thing. Assisting the well-damped suspension are a pair of front seats that offer thick cushioning and adequate bolstering. Seriously, these seats are Volvo good. Covered storage is abundant, with a spacious area under the center armrest accompanying generously sized areas ahead of the twist-dial gear lever and atop the dashboard. A three-across rear bench is both spacious and long-haul comfortable. With 40.6 inches of legroom, 40.3 inches of legroom, and 60.5 inches of shoulder room, the Edge’s 60/40 split-folding bench bests the Blazer’s by 1.0, 1.7, and 1.9 inches, respectively. Cargo space is plentiful, as well, and the Edge’s rear hatch can swallow 39.2 cubic feet of stuff with the rear seats in place – 8.7 cubes more than the Chevy. While every Edge ST sports a standard 8.0-inch touchscreen infotainment system that’s Apple CarPlay and Android Auto compatible, a pair of 4.2-inch gauge cluster screens, and a 4G LTE wireless hotspot that connects up to 10 devices, ST’s equipped with the $5,585 401A equipment group (like this tester) add comfort and convenience items such as an in-dash navigation system, a wireless charging pad, an AC power outlet, a front-facing camera, an active parking system (parallel and reverse perpendicular), a panoramic sunroof, heated and cooled front seats, and heated rear seats (the package also includes a number of active safety features). Our ST also features the Cold Weather package, which adds items such as a heated steering wheel and windshield wiper de-icer for $495. Despite its formidable features list, the Edge ST often feels behind the technology curve. Blame the Sync 3 infotainment system that’s slow to respond to inputs and the dated-looking graphics of the gauge cluster screens. Nevertheless, the system’s ergonomics are commendable. Credit Ford’s decision to place hard buttons on the center stack that control key audio and climate control functions and complement the system’s generally logical on-screen menus. 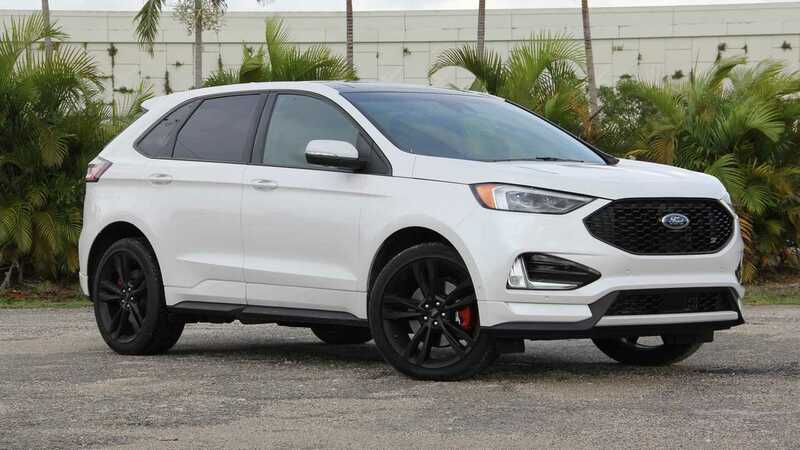 Don’t think of the Edge ST as a plus-sized Fiesta ST, as the 4,477-pound crossover lacks the lithe lateral dynamics and driver engagement of the sub-3,000-pound subcompact hatch. Compared to the standard Edge, however, the Edge ST is a riot. Credit the twin-turbocharged 2.7-liter V6 engine. With 335 horsepower and 380 pound-feet of torque, the bi-turbo bent-six betters that of the Blazer RS’s naturally aspirated 3.6-liter V6 by 27 horses and 110 pound-feet of torque. That twist makes itself known anytime the throttle pedal is matted to the firewall, and the all-wheel-drive Edge ST always feels ready to pounce off the line. Putting the engine’s power to the road is an eight-speed automatic transmission that upshifts smoothly, but is irritatingly slow to downshift. Switching to the more aggressive Sport mode invokes quicker response times, but it practically eliminates the gearboxes desire to tap into its overdrive gears. (Sport mode also uses the audio speakers’ active noise cancellation technology to amplify the engine’s growl in the cabin.) Steering-wheel-mounted paddle shifters afford manual control of the transmission, however, their slow responses mean it’s best to simply press the Sport button and let the transmission do the shifting itself during more dynamic drives. Although every Edge ST benefits from model-specific suspension changes that include revised front and rear springs and mono-tube shock absorbers, only models equipped with the $2,695 ST Performance Brake package feature a set of sticky Pirelli P Zero tires wrapped around 21-inch wheels. The package also includes more fade-resistant brake pad material and front rotors, as well as an upgraded radiator cooling fan. With the ST Performance Brake package, the Edge ST is eager to exercise the lateral limits of its summer rubber. Turn-in is sharp and body motions are generally well controlled. It’s a shame the steering is so numb and artificially heavy, because the chassis is stiff and reasonably communicative, while the brake pedal’s firm and predictable action is as good as many sports cars’. While the Edge ST’s dynamics certainly top those of its four-cylinder sibling, the model fails to entertain the driver in the way we expect an ST-badged vehicle to do so. Consumers serious about driving ought to spend their money on more expensive premium performance-oriented crossovers or save their money and embrace the cushier and more detached driving experience of the standard Edge. As in every Edge, the Edge ST comes standard with Ford’s Co-Pilot 360 suite of safety features. The setup includes a blind-spot information system with rear cross-traffic alert, a lane-keep assist system, automatic emergency braking with pedestrian detection, and automatic high-beam headlights. Springing for Co-Pilot 360 Assist+ (included in the pricey 401A equipment group or a $795 package on its own) adds adaptive cruise control, a lane-centering system, and an evasive steering assist system (which uses the power steering system’s electric motor to help the driver steer around an imminent crash) to the mix. LED headlamps are standard across the board, however, ST’s fit with the equipment group 401A package include a set of adaptive units that follow the path of the road. Regardless, the Insurance Institute for Highway Safety (IIHS) rates both headlight setups as “Poor” (the lowest score it gives). Additionally, the IIHS fails to award the crossover its Top Safety Pick or Top Safety Pick + ratings. That said, the Edge receives high ratings in most IIHS testing categories, including all front and side tests. The National Highway Traffic Safety Administration (NHTSA) has yet to put the latest Edge through its barrage of safety tests. Even with its potent V6 powertrain, the Edge ST earns competitive EPA fuel economy ratings of 19 miles per gallon city, 26 mpg highway, and 21 mpg combined. That’s one mpg better than the less powerful Blazer RS in the city and on the highway, and two better on the highway than the less powerful Hyundai Santa Fe 2.0T with all-wheel drive. Assisting the Ford’s fuel efficiency is an all-wheel-drive system that decouples the rear driveshaft – if conditions permit – automatically to limit parasitic losses. While Ford does not require premium fuel in the ST, the model’s engine produces all 335 horses when running 93-octane. Expect a smidge less power with lower fuel grades. Those in search of even greater fuel efficiency ought to look at the run-of-the-mill four-cylinder Edge. The 250-hp model earns 22 mpg in the city, 29 mpg on the highway, and 25 mpg combined when equipped with front-wheel drive. All-wheel-drive models return 21 mpg city, 28 mpg highway, and 23 mpg combined.